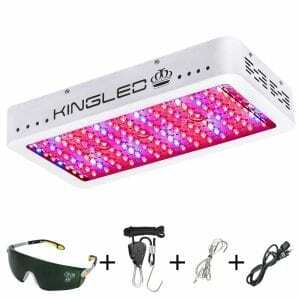 This King Plus 1200W review is all you need to make up your mind if you are conflicted about whether you should or shouldn’t buy this LED grow light. We extensively tested this light in our grow room and we can tell you all about it. The LED grow light is powered by a 10W LEDs giving off light equivalent to around 800W-1000W. It has a lifespan of over 50,000 working hours. 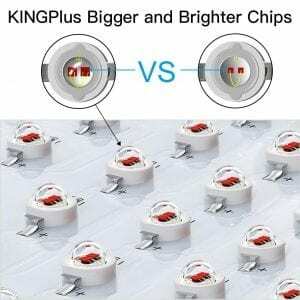 Were you looking for a smaller light of King Plus? We also reviewed the King Plus 1000W and the King Plus 600w! 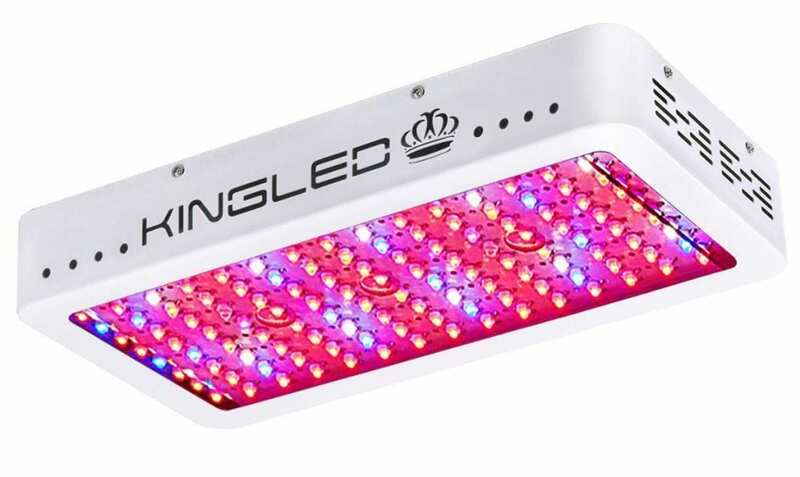 King Plus used high-quality materials in this LED grow light. The design delivers the most usable light to your plants. The dimensions are 15.7″ X 8.3″ X 2.4″ and its weight is 6.6lbs. It is made in China. It has 120 pieces of 10W (120 x 10W = 1200W) Dual Chip LEDs installed, which leads to intense and denser light. 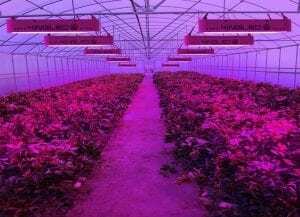 This increases the rate of light penetration to the plants. King Plus 1200W LEDs are the perfect substitute for sunlight. The spectrum band includes red, blue, yellow and white light. The color band creates a well-balanced light spectrum for the plants. The red to blue ratio is good enough for the entire lifecycle of the plant. It has UV light to kill off bacteria, reduce vegetative ailment and IR to help in plant growth. Blue light enhances the growth during vegetation, whereas red produces healthy and resinous flowers and buds during blooming. 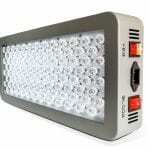 The LED grow light provides comparatively brighter light than other grow lights in its price range. However, it doesn’t have the ability to be daisy-chained or veg and bloom mode. 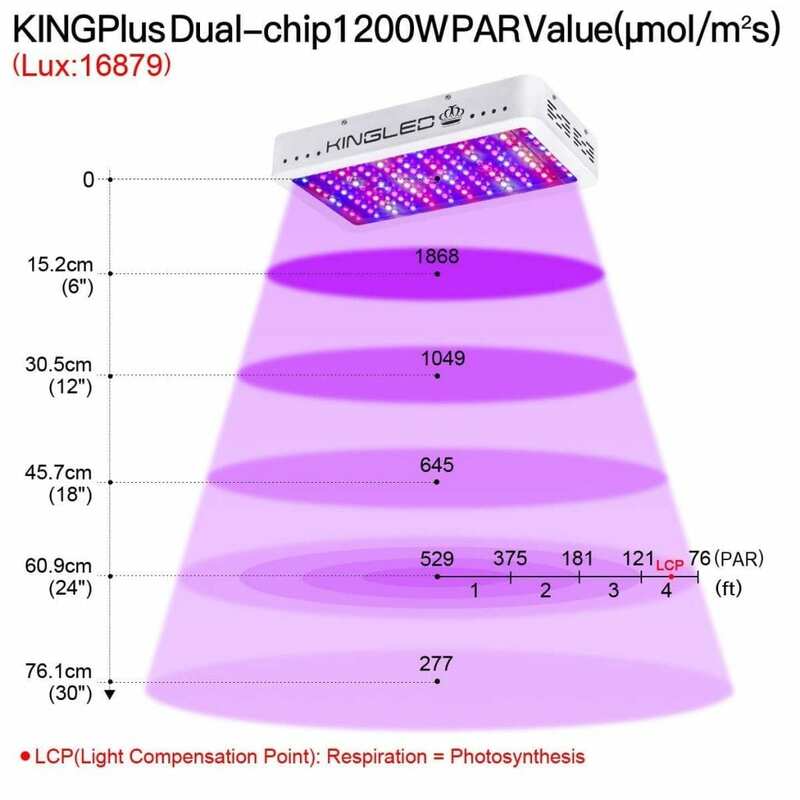 The King Plus 1200W focuses on providing high intensity, absorbable light to the plant canopies. Focusing angles of 90 and 120-degrees help to improve light penetration and distribution. It can outperform a 400W COB. However, despite its wide range spectrum and PAR from 18 inches being 645 uMol, it does fall short when compared to high-end models. You still have to realize at its price point it is a steal. As far as the spectrum band is concerned, the LED grow light is perfect for beginners. The aluminum heat sink and 4 fans to cool ensure the dissipation of heat; the plant absorbs 90% of the heat generated. 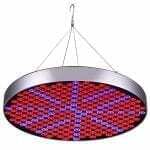 The LED lights are separated to avoid burning out in case of fluctuation. It has 3 small holes on the glass that dissipate heat. The King Plus 1200w has a mode for power saving, using 320-340W as it provides light with full intensity. Hence it is energy efficient. The light gives off reduced rate of CFCs as to not deplete the ozone. It is recommended to turn the light on for 12-14 hours in the growing stage, 9-12 hours in flowering stage and 7-8 hours for fruiting stage. Keep away from water don’t move while it operates optimal results. King Plus 1200W has coverage of 3.5’x5.2’, however, one should consider the recommended height is 24-30 inches. It has a 3-year warranty and a 30-day money back policy. The customer service is complex in comparison to similar companies. Interested to see what yields this light produces? Check out the video below! The King LED 1200W lights are most suitable for beginning indoor growers. 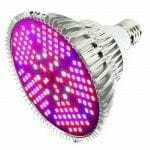 The LED grow light has 5W dual chips and electric circuits that are very energy-efficient, consuming the energy of about 300W. Only though providing light equal to 800W, this is a must-have for your indoor growing plants and garden. The full spectrum provides a nice mimic of sunlight, whereas UV and IR radiations collectively help to elongate the stem and sterilize the bacteria. Take the step towards this horticultural innovation and give your indoor plants a full-time sunlight dose with this King Plus 1200W. Are you looking for more lights in this price range? Check out the Phlizon Newest 900W.